A rich collection of the work of the Partnership for 21st Century Skills can be found on the P21 Web site –including detailed explanations and white papers on the skills and educational supports in the P21 framework, research studies, publications and policy reports, the results of national surveys, and a description of the work going on in a number of U.S. states to integrate 21st century skills into the fabric of everyday learning. A special repository of resources, called “Route 21” provides a one–stop shop for 21st century skills–related information, resources, and community tools. You are encouraged to rate the resources you use in Route 21 and to add new resources you find useful in teaching, learning, and developing 21st century skills. The goal is for Route 21 to be a universal collection of the most useful and effective resources available on 21st century learning. The following are online resources the authors have found informative and useful in their work on 21st century learning. 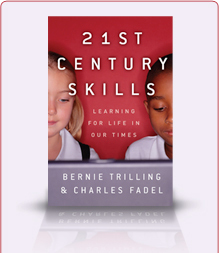 This list is not intended to be exhaustive—it is merely a selection of organizations and programs the authors have found helpful in moving aspects of the 21st century skills movement forward. A number of high–tech corporations are making substantial philanthropic investments in global programs to attract students to technical fields and to train and certify them in technical skills, building some of the essential knowledge work skills needed in the 21st century. These so–called academy programs provide teachers, professors, and technical institute staff the training, technology tools, and curricular resources to bring their students up to certification–level competence in a variety of technical and business fields. One useful online guide to resources that develop critical thinking and problem solving can be found at the Foundation for Critical Thinking. Among a wealth of information literacy sources, one stands out as particularly informative and useful—the collection of online resources from the American Association of School Librarians. These standards for 21st century learners and the accompanying resource materials clearly outline the skills needed to be an information–literate student, teacher, and librarian in our times. The Asia Society has a wealth of resources on international and cross-cultural education. In addition to the many programs and courses for new and in–service teachers at education colleges around the world, a number of corporations and foundations are also investing in the professional development of primary and secondary teachers. Many of these programs provide practicing teachers the training to integrate both technology tools and 21st century skills into their teaching methods. One example of the many programs that help students develop their leadership and responsibility skills—in this case in an international context—is the Model UN program, where students simulate United Nations council meetings to resolve an international crisis—see www.nmun.org. An international organization that is pioneering large-scale assessments of some of the 21st century skills is the Organization for Economic Cooperation and Development (OECD) Programme for International Student Assessment (PISA).